Fast food is a no no when you're looking to lose weight (unless you're having a cheat day that is). 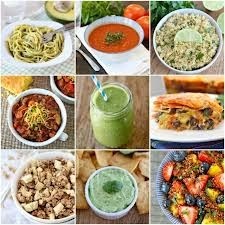 You are better off sticking with healthy recipes that will help your weight loss goals rather than hinder it. However that doesn't mean you can't have a 'fast food' type meal why you are dieting. Here is one of my favorite healthy weight loss recipes for burger and chips. You get the chip shop taste without the extra calories and guilt that comes with it. The Burgers are made from extra lean beef mince or turkey mince and the chips (or wedges) are made from sweet potato - a delicious alternative to the traditional variety. Also we will be using coconut oil instead of other oils because of the amazing health benefits that coconut oil provides. It also provides a lovely aroma when cooking with it. 1. Mix all ingredients together in a bowl, divide it into 4 portions. 1. Slice up the sweet potatoes so they look like wedges. 2. Toss all ingredients into large bowl then place in a large baking tray in oven at around 200-220 degrees C for 30-40 mains. 3. Serve alongside a bed of steamed greens. This healthy recipe for weight loss is perfect for those evening or weekends when you feel like getting a 'dirty takeaway' and you don't want to undo all your hard work and diligence of following whatever program you are following. I often have this as a 'clean' cheat meal. Because you are cooking this yourself and you can monitor how much and what you use in it, you will be better aware of the foods you are eating which means you will have greater control over your results. Try it out and let me know how you get on. I'd love to hear your feedback on it and if you have suggestions to make the recipe better I'd love to hear them.